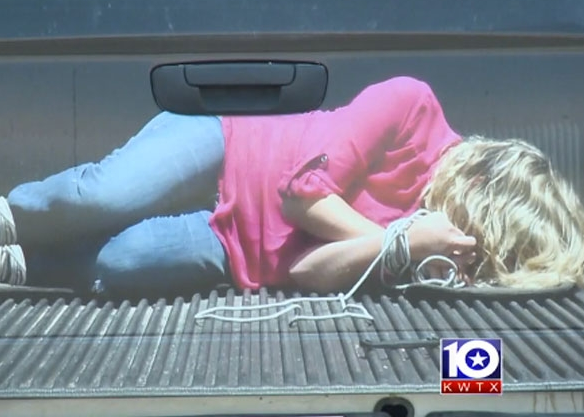 A Texas signage company is currently advertising just how realistic its tailgate decals are with an image of a woman who has been bound, gagged and held captive in the back of a truck. Stick this decal on the back of your vehicle and -- just like that! -- it will look like you have committed a terrible act of violence. Not surprisingly, many people in the area became upset after seeing the abducted woman decal, which, apparently, the owner of said company did not anticipate. "I wasn't expecting the reactions we got, nor do we condone this by any means,” Brad Kolb, the owner of the company (which won't get named or linked to here because this company is a terrible company) told a local news station. “It was more or less something we put out there to see who noticed it." Violent misogyny used as an "edgy" gimmick to make money? Sounds very, very familiar.